I also do VO jobs. I have been in government for 17 years now. Victor and Sharie placed their bet for my hosting services at the famous w@w auction — a yearly activity conducted in support of w@w’s Christmas celebration. Guess what? Sharie won!!! And I am always more than happy to serve as host for the winners of the w@w auction. The couple came all the way from the Japan where they worked for quite sometime already. They met there, had their beautiful pre-nup photos taken there and flew all they way from Japan to be blessed at Calaruega as husband and wife. Sharie has a sweet voice – a nice singing voice and it was proven by her special rendition of “At the Beginning” at the end of the program. 🙂 (at the beginning at the end!? un-huh 🙂 LOL) Totally Mesmerized accompanied Sharie beautifully. 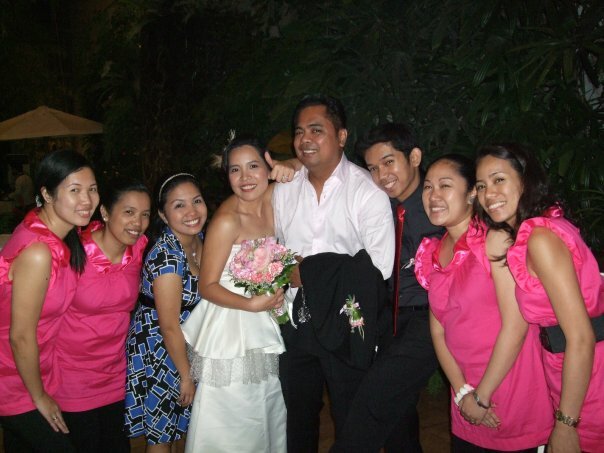 It was my first time to work with Daniel Lei and I had this impression that he and his wife and team were suplados. Hindi naman pala… I think they were just focused on their tasks. Here is the result of their focus and dedication to the project — Sharie & Victor — Smack into Love. It was my first time to host an event at Summit Ridge Hotel. Personnel were very courteous and helpful from the account manager to the waiters, maintenance people and security guards. An easy-to-find venue for those who want a hotel set-up for their Tagaytay wedding. Click here for more info about Summit Ridge Tagaytay. anu’ng masasabi ko? kay babait nitong mga taong ito. kay pogi ng anak! they’re so humble and so nice to work with. bait din ng ninong at ninang at ng kapatid nung nagpaturo ako ng konting German. matagal na sila sa Vienna, pero mas dama ko ang pagiging taga-probinsiya nila…magagalang, mapagkumbaba, may magagandang asal. kahit nasa malayong lupain sila sa Europa, nananatili silang Filipino sa tunay na diwa nito. saya ng araw na ito!!! i started 2010 with a bang! 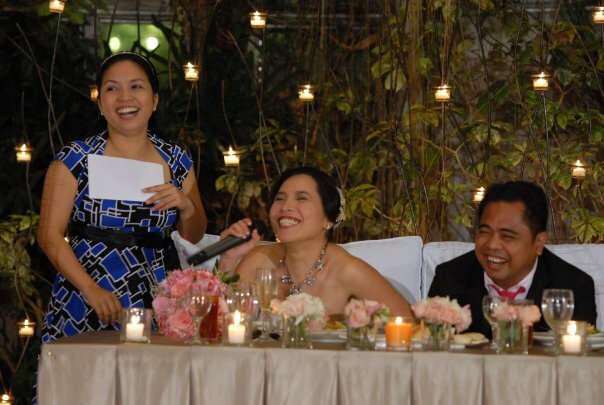 this photo tells just a bit of of how fun fun fun and touching were the moments at Pong and Mitch’s wedding party at The Glass Garden in Pasig. pong and mitch were yosimates way back in college and after more than a decade of being together, they finally said yes, made a solemn vow to be yosimates and husband and wife together, for as long as they both shall live. 10. You start reading an average of 50 emails a day… or at least try to. 9. You start referring to yourself as a W@Wie. 8. You take your wedding preparations seriously and try to devote 70% of your life to it. 7. You know http://www.WeddingsAtWork.com like a back of your hand. 6. 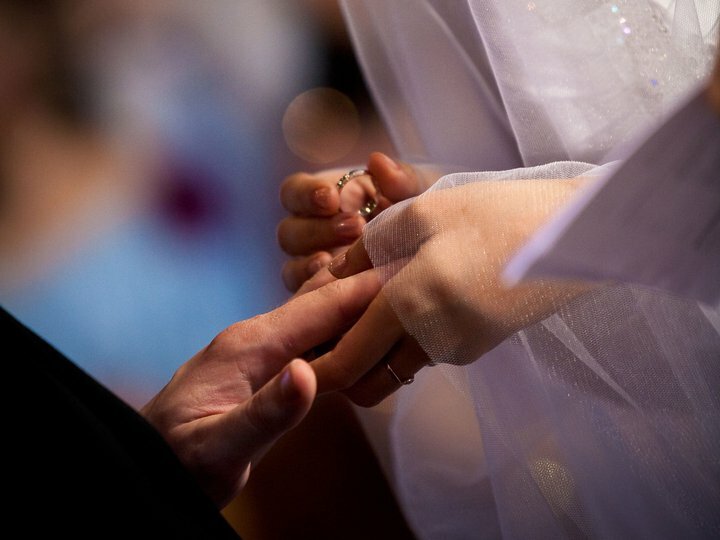 You start recommending the website and the W@W eGroup to your soon-to-be married friends. 5. You know what MIL, H2B, DIY, TMU, OTD means. 4. You unconsciously sign your e-mails to your non-W@Wie friends with your name, fiancé’s name, date of wedding, ceremony and reception venues. 3. Finishing your suppliers’ rating is a dream… other than the wedding, of course. 2. You are now maintaining a blog. 1. Benz is not just a car to you. About the Author: Dionne est une W@Wie et elle est fiançée pour être marié Joven en Juin 2006. Toujours les découvertes ménagent dans tout. Les amours pour rire mais sentent même si riant mieux avec quelqu’un. Vraiment pourrait être sinistre si la situation l’appelle. Extrêmement inflammable. TM Events can really do anything that you desire (given ample time to plan and the right budget!? ahihihi) Please feel free to contact us!